You've just fielded a key study and can't wait to see the data and find the story within. To answer the immediate questions and explore new hypotheses. To share results online. In minimal time and cost. 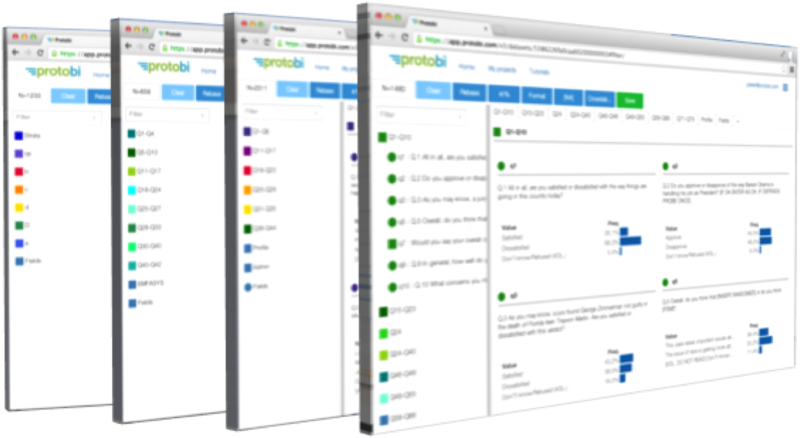 Protobi provides interactive online visualizations for survey data. It displays distributions and dynamic crosstabs with statistical comparisons to baseline. And intelligently handles routine complications like rounding, missing values, and text verbatims. Survey data. About customers, patients, products.... The research professionals who collect and interpret it. The decision makers who rely on it. People who need to quickly see all the data, to answer client questions, refine hypotheses, and deliver results fast.